CAbles & accessories - ab-precisons Webseite! To support precision measurements, we supply a set of cables and cable accessories / componets that enable our customers to get the most out of their test gear. Please consult the data sheets regarding all technical details of these products. All these products are intended for precision measurements and due to their uninsulated connectors are intended solely for Secure Extra Low Voltages (SELV). Custom version of the products listed are available on request. Please contact us. The LEC1-4-1.0 cable is a low-EMF (electromotive force) cable for low-voltage (SELV), precision measurements where low thermoelectric voltages are key. It is a 1m long 4-wire twisted, shielded PTFE cable with gold-plated, crimped copper spades. 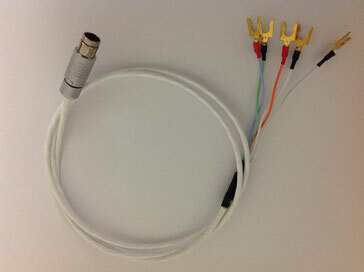 Twisted shielded cable reduces the impact of electrical noise on the measurement. PTFE as insulation material reduces leakage currents, which is especially important for high-ohms or low current measurements. Although the cable is rated for a much higher voltage, due to its intended use and non-insulated spades we specify this cable for SELV (Safety Extra Low Voltage) voltages up to 42V peak only! Besides the standard version (-S) with 10 spades, versions with 10 low EMF gold plated 4mm banana plugs (-B) or a combination thereof (-SB) with 5 each spades and 4mm-plugs are available (see picture below of version with spades and 4mm connectors). For forther details refer to the data sheet below. Other lentgth are available on request. Please contact us. Gross price includes 19% VAT. 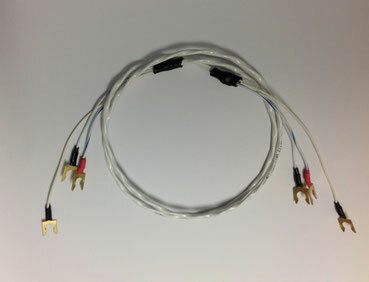 The CBLF-1 is a 1m long test cable using a 4-wire twisted, shielded cable together with a 5 pin Fischer connector, as e.g. used on the Solartron 7081 and 7071 precision DMMs but intended for general purpose low EMF measurement use. It is specialized for low-voltage (SELV voltages only! ), precision measurements where good shielding and high insulation resistance are key. The 4 AWG18 wires are silver plated and come with a PTFE insulation, thus also minimizing leakage currents, which is e.g. important for high ohms measurements. The tin plated outer shield is woven and thus has a very good shielding coverage and is connected to the Guard terminal. 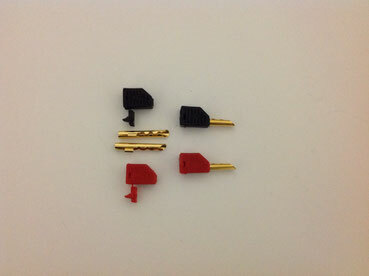 It is available in two versions, with gold plated copper spades (-S) or 4mm copper-beryllium banana plugs (-B). 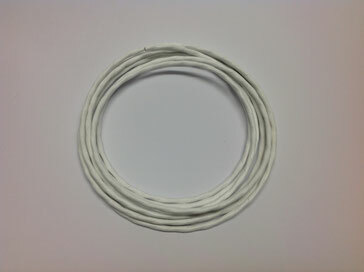 The CBLK-1 is a 1m long test cable using a 2-wire twisted, shielded cable together with a 2 pin circular connector with silver plated copper alloy contacts for low EMF, e.g. mating the Keithley 181 and 182 sensitive voltmeters but intended for general purpose low EMF applications. Due to the non-insulated spades used and its material selection, it is foreseen for low-voltage (SELV voltages only) precision measurements where good shielding and high insulation resistance are key. The 2 AWG20 wires come with a ETFE insulation, thus also minimizing leakage currents. The tin plated outer shield is woven and thus has a very good shielding coverage and is connected to the Guard terminal. It is available in two versions, with gold plated copper spades (-S) or 4mm copper-beryllium banana plugs (-B). The LEC1-4-S cable set is a Low-EMF (electromotive force) solution to build your own customized precision cables for use in low-voltage, precision measurements where low thermoelectric voltages are key. It consists of 20 gold-plated copper spades and 3m of 4-wire AWG18 twisted and shielded PTFE cable, and shrink tubes, allowing to produce e.g. up to 2 cables with 1.5m length each. 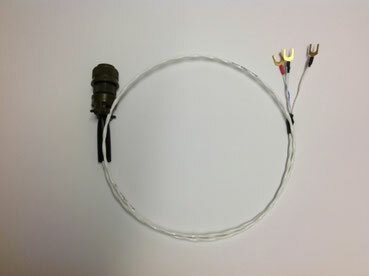 Twisted shielded cable reduces the impact of electrical noise on the measurement. 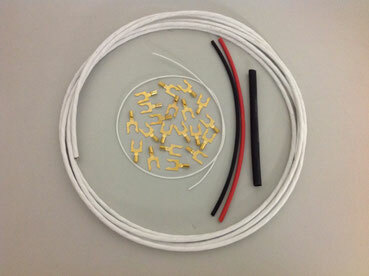 PTFE reduces leakage currents, which is especially important for high-ohms measurements. Both crimping or soldering is possible, but crimping is recommended. Besides the standard version (-S) with 20 spades, versions with 20 low EMF gold plated 4mm banana plugs (-B) or a combination thereof (-SB) with 10 each spades and 4mm-plugs are available (see picture below of version with spades and 4mm connectors). For forther details refer to data sheet below. The LEC2-2-S cable set is a Low-EMF (electromotive force) solution to build your own customized precision cables for use in low-voltage, precision measurements where low thermoelectric voltages are key. It consists of 24 gold-plated copper spades and 6m of 2-wire AWG20 twisted and shielded ETFE cable, and shrink tubes, allowing to produce e.g. up to 4 cables with 1.5m length each. 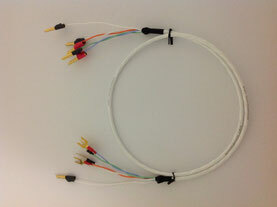 Twisted shielded cable reduces the impact of electrical noise on the measurement. ETFE reduces leakage currents, which is especially important for high-ohms measurements. This cable set is intended for applications where voltages are measured or for 4-wire ohms measurements where the positive and negative cables should be separated from each other (such as e.g. for the Datron 1281) to achieve even lower leakage currents. Both crimping or soldering is possible, crimping is generally recommended (banana plugs can only be soldered). 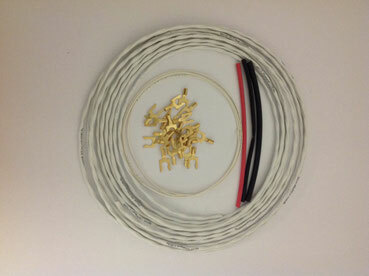 Besides the standard version (-S) with 24 spades, versions with 24 low EMF gold plated 4mm banana plugs (-B) or a combination thereof (-SB) with 12 each spades and 4mm-plugs are available (see picture below of version with spades and 4mm connectors). The LSP1-20 is a set of 20 low-EMF (electromotive force) gold-plated Copper spades for low-voltage (SELV), precision measurements where low thermoelectric voltages are key. It comes with black and red shrink tubes for the insulation of the spade ends. The spades are intended for soldering or preferably crimping. They have two captive teeth to facilitate attachment of spades to binding posts. For further details see data sheets above, also covering this spade. The spade outer diameter is about 4mm, the inner diameter is about 2.5mm. We use a crimping tool for AWG 18-22. Select your crimping tools according to your specific needs. This spade is also used for our cable sets and cables. 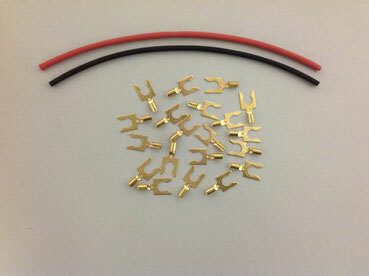 The LBP1-20 is a set of 20 low-EMF (electromotive force) gold-plated Copper-Beryllium banana plugs (10 black, 10 red) for low-voltage, precision measurements where low thermoelectric voltages are key. It comes with black and red insulation bodies. The plugs are stackable. The bananas support soldering. They are intended to fabricate SELV (Safety Extra Low Voltage) cables (plug ends non-insulated) with low EMF voltages together with CuTe binding posts. For mixed cables combine them with the spades shown above to build cables with both banana and spade ends. The CBL1-4-5 is a 5m long piece of 4-wire twisted, shielded cable intended for low-voltage, precision measurements where good shielding and high insulation resistance are key. 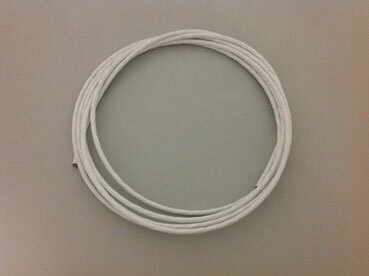 The 4 AWG18 wires are silver plated and come with a PTFE insulation. For further details see data sheets above, also covering this cable. PTFE reduces leakage currents, which is especially important for the measurement of high-ohms or low currents. The tin plated outer shield is woven and therefore has a very good shielding coverage. The outer insulation is also PTFE. 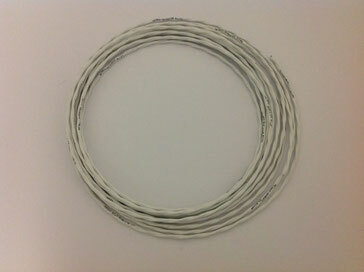 This cable can also be used to build a 2-wire twisted cable (combining opposite internal wires to form each conductor) with further improved magnetic field insensitivity. Different from a standard 2-wire twisted cable which always has a certain cross section between the two wires, such a setup will minimize the cross-section between the two conductors formed to essentially close to zero (as the two conductors formed are effectively both in the center of the cable), thus also any impact of magnetic fields inducing noise in the cable will be drastically improved. The CBL3-2-4 is a 5m long piece of 2-wire twisted, double shielded cable intended for low-voltage, precision measurements where maximum shielding and high insulation resistance are key. The 2 AWG20 wires are silver plated and come with a PTFE insulation, thus also minimizing leakage currents, which is e.g. important for high ohms measurements. The two silver plated outer shields are woven and seprareted from each other through an insulation layer. The double woven shielding achieves has an excellent shielding coverage. This cable should be used where highest insulation resistance and maximum shielding is key. All cables and cable accessories above are intended for the precision measurement of low voltages and are only specified for the use with SELV voltage levels. The special requirements of precision measurements, such as e.g. the use of copper spades, do not permit insulation against higher voltages. SELV means Safety Extra Low Voltage; usually defined to be maximum 42V peak. These voltages, when in contact to the human body, are defined by regulatory standards as causing no harm. Local regulations may define slightly different voltage levels for SELV. Please review your local regulations to check if they demand a lower level but never exceed 42V peak. The use of all products listed above with higher voltage levels than SELV is strictly prohibited!